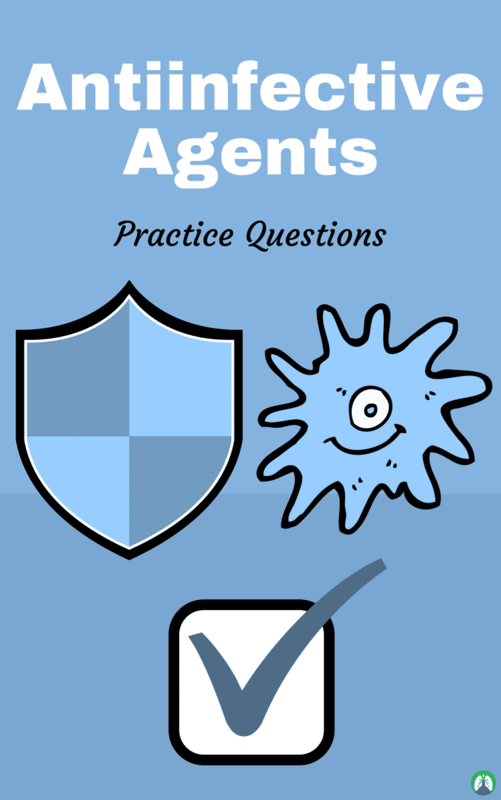 This article contains a ton of helpful practice questions all about Anti-Infective Agents. So if you’re a Respiratory Therapy student looking for an awesome review on this subject, then you’re definitely in the right place. Anti-Infective Agents are a class of medications that you will need to know and understand as a Respiratory Therapist. The foundation for this class of drugs begins in the Pharmacology course in school. This is why we made this study guide for you in order to help expedite your learning process. Are you ready to get started? I hope so because here we go! 1. What is an Anti-infective agent? They are substances that act against or destroy infections including: bacteria, viruses, Protozoa, and parasites. 2. What alternate therapy is most likely prescribed for a patient with pneumocystis pneumonia, who is unable to tolerate trimethoprim-sulfamethoxazole therapy? 3. What drug will a respiratory therapist use as an alternative to intravenous therapy in a patient with cystic fibrosis to manage a chronic Pseudomonas aeruginosa infection? 4. What aerosolized anti-infective agents are used in the airway management of a patient with cystic fibrosis who has had the Pseudomonas aeruginosa infection? Inhaled tobramycin (TOBI) and inhaled aztreonam (Cayston). 5. What agent is used in the treatment and prophylaxis of H1N1 influenza A? 6. What are the possible side effects observed in a patient under parenteral pentamidine therapy? Leukopenia, hypoglycemia, and abscess formation. 7. What is an antiprotozoal aerosolized anti-infective agent? 8. What medication is beneficial for a patient diagnosed with bronchiolitis caused by respiratory syncytial virus (RSV)? 9. What drug prevents bronchoconstriction in a patient with pneumocystis pneumonia (PCP) and is under aerosolized pentamidine therapy? 10. A physician prescribes nebulized tobramycin to a patient. For what conditions does a respiratory therapist check the patient’s medical history before administration? Renal impairment, vestibular problems, and neuromuscular dysfunction. 11. What aerosolized medication would be used to treat a patient with acquired immunodeficiency syndrome (AIDS) who has opportunistic pneumonia caused by pneumocystis jiroveci? 12. What aerosolized medication should a respiratory therapist prescribe while treating an 8-year-old child with acute, community-acquired, atypical pneumonia caused by influenza A? 13. What systemic side effects are most likely to have occurred in a patient who was switched from parenteral pentamidine (Pentacarinat) therapy to aerosolized pentamidine (NebuPent) to prevent systemic side effects? Leukopenia, hypotension, and hepatic dysfunction. 14. What possible pulmonary side effects are observed in a patient on aerosolized ribavirin therapy? Apnea, pneumothorax, and bacterial pneumonia. 15. What are the systemic reactions that are observed in a patient under aerosolized pentamidine therapy? Dysglycemia, conjunctivitis, and renal insufficiency. 16. What is an indication for Aztreonam? To improve pulmonary symptoms in cystic fibrosis patients with pseudomonas aeruginosa. It is the drug we typically give to cystic fibrosis patients. Its brand name is TOBI and Bethkis. The dose is 300 mg/ 5ml ampule. Its clinical use is to treat Pseudomonas aeruginosa in Cystic fibrosis. 18. What is Pentamidine isethionate? Brand name: NebuPent; dosage: 300 mg of powder in 6 ml of sterile water; 300 mg once every 4 weeks; and, clinical use: PCP prophylaxis. Brand name: Virazole; dosage: 6 mg of powder in 300 ml of sterile water (20-mg/mL solution) given 12-18 hr. /day for 3-7 days by SPAG-2 neb; and, clinical use: RSV. It is used with RSV (respiratory syncytial viral) infections in children and infants at risk for severe or complicated disease, influenza, and the herpes simplex virus. Brand name: Cayston; dosage: 75 mg/1mL; adults and children over 7 years: 75mg TID, 28 days on 28 days off; and, clinical use: Pseudomonas aeruginosa in Cystic Fibrosis. Brand name: Relenza; DPI: 5mg/inhalation; adults and children over 5: 2 inhalations (one 5-mg blister per inhalation) BID less than 12 hours apart for 5 days; and, clinical use: Influenza. It is an Antiviral agent approved for use in the treatment of uncomplicated influenza illness in adults and children older than 7 years during early onset (within the first 2 days) of infection. 22. What is Aerosolized Pentamidine used for? Prevention of PCP (Pneumocystis pneumonia is a fungus) in high risk human immunodeficiency virus (HIV) infected patients. 23. What is the Pentamidine brand name? 24. What is a Pentamidine nebulizer? Respirgard II (no medication can escape because of the expiratory filter, thumb port, one way valves). 25. What is the Pentamidine Dose in dry powder? 300mg in 6 mL of sterile water every 4 weeks. 26. What is the description of the Pentamidine administration? It should not be exposed to the medication. It is given with the Respirgard II nebulizer at a flow rate of 5-7L/min from 50 psi gas source. 27. What are the Pentamidine side effects? Parenteral: Hypoglacemia, impaired renal function; aerosol: Cough, bronchospasm, shortness of breath, bronchial irritation, and wheezing, spontaneous pneumothoraces; and, should be used with B-adrenergic bronchodilator before inhaling aerosolized pentamidine. 28. What is the Ribavirin brand name? 29. What is the Ribavirin nebulizer? The SPAG II (1.3 micro meter MMD, large volume). 30. What is the normal Ribavirin Dose? 20mg/ml 12-18 hours per day; minimum 3 days; and, maximum 7 days. 31. What is the RSV Respiratory syncytial virus infection? RSV sticks to cells changing their shape and this produces very sticky mucus. 32. Can you administer Ribavirin to infants? Manufacturers warn against the administration of the drug to infants on mechanical ventilation. 33. What are the Ribavirin side effects? Pulmonary: worsening of asthma or COPD; cardiovascular: hypotension, cardiac arrest; hematologic: blood cells; dermatologic/topical: rash, conjunctivitis; and, equipment-related: impairment of expiratory valves and sensors. 34. What is the Palivizumab brand name? 35. What are the Palivizumab side effects? Anaphylaxis, fever, upper respiratory infection, otitis media, rhinitis, rash, and coughing/wheezing. 36. What is the description of the Aztreonam administration? Each patient should be pretreated with bronchodilator before each dosing. Any prescribed mucolytic should also be given before Cayston and should be refrigerated. 37. What is the Aztreonam mode of action? In vitro activity against gram-negative aerobic bacteria and binds to penicillin-binding proteins of pathogens, such as Pseudomonas aeruginosa. 38. What are the Aztreonam side effects? Injectable aztreonam has caused severe allergic reactions and nebulized: bronchospasm and decrease patient’s FEV1. 39. How to prevent the Aztreonam environmental effects? Use expiratory filters with one-way valves and thumb control. 40. What are the Zanamivir side effects? Bronchospasm, deteriorating of lung function, undertreated of bacterial infection and allergic reactions. 41. What are the clinical indications from pentamidine? Prevention of pneumocystis pneumonia (PCP) in HIV infected patients. 42. What is Ribavirin given for? 43. What is Tobramycin given for? Pseudomonas aeruginosa in cystic fibrosis patients. 44. What is another name for Aztreonam and what is it given for? Cayston; and it is given for Pseudomonas aeruginosa in cystic fibrosis. 45. What is the Pentamidine mode of action? Unknown but may block RNA and DNA synthesis. 46. What are the RSV resulting diseases? It can cause bronchiolitis and pneumonia, mainly in children. Outbreaks occur in the late fall through the early spring. 47. What is the Ribavirin mode of action? 48. What is the Zanamivir mode of action? Binds to enzyme neuraminidase thus blocking the enzymes action. 49. What is the Aztreonam mode of action? Inhibits bacterial cell wall synthesis and ultimately death of the cell. 50. What are the Pentamidine aerosol side effects? SOB, cough, bad taste, bronchospasms and wheezing, pneumonothoraces, eye and skin, irritation and hypoglycemia. 51. What are the Relenza limitations? DPI for children age 5 and above and adults. 52. What is the Respirgard II Neb used for? 53. What is the SPAG used for? 54. What are the indications for Pentamidine? Prevention of Pneumocystis pneumonia (PCP) in HIV patients. 55. What is the Pentamidine brand name? 56. What is the description of the Pentamidine aerosol administration? It is for Prophylactic Therapy and for Local targeted lung delivery. Fewer or less severe side effects compared with systemic administration. 57. What is the Pentamidine dose? 300 mg given by inhalation once every 4 weeks, dry powder, 300 mg/vial, reconstituted with 6 mL of sterile water and not saline (can cause precipitation). 58. What is the description of the Pentamidine administration? Powered by a flow rate of 5-7 L/min from 50-psi gas source, escaped particles may be filtered to limit exposure of healthcare workers, nebulizer performance and mass median diameter (MMD) of 1-2 μm. 59. What is the Pentamidine nebulizer name? Respirgard II (manual system with thumb port). 60. What are the side effects of Pentamidine? Hypoglycemia (up to 62% of patients) with cumulative cytotoxic effect on pancreatic beta cells; impaired renal function and azotemia; cough and bronchial irritation; shortness of breath; bronchospasm and wheezing; and, spontaneous pneumothoraces. 61. What are the environmental precautions of Pentamidine? Use nebulizer system with one-way valves and expiratory filter; stop nebulization if patient takes mouthpiece out of mouth (thumb control on power gas tubing gives more control); use nebulizers producing an MMD of 1-2 μm to increase alveolar targeting and decrease large airway deposition and cough production; and, do not let patient out of room. 62. What is the description of the Aerosol Therapy for Pentamidine? Oral trimethoprim-sulfamethoxazole (TMP-SMX) preferred for prophylaxis of PCP, as long as adverse side effects from TMP-SMX were absent or acceptable. 63. What are the Ribavirin indications (aerosolized)? Treatment of hospitalized infants with severe lower respiratory tract infection caused by respiratory syncytial virus (RSV) and active against influenza viruses and herpes simplex virus. 64. What is Respiratory Syncytial Virus (RSV)? It can take over only on children not in adults. Cells change their shape when RSV sticks to cell and this produces very sticky mucous. Can cause bronchiolitis and pneumonia, formation of large, multinucleated cells, or syncytium and inflammation of small airways. 65. What is the mechanism of action of Ribavirin? Virostatic not virocidal; inhibits both DNA and RNA (retrovirus) viruses; highly toxic; and, not completely understood. Probably based on its structural resemblance to nucleosides used to construct the DNA chain. 66. What is the Ribavirin dose? 20-mg/mL solution; 12 to 18 hour/day; minimum of 3 days; not more than 7 days; supplied as 6g of powder in 100-mL vial; and, concentration of 6 g/300 mL. 67. What is the Ribavirin nebulizer? SPAG (Large volume, pneumatically powered nebulizer); approximately 1.3 μm, MMD; and, solutions in the SPAG reservoir should be replaced after 24 hours. 68. What are the pulmonary side effects of Ribavirin? Deterioration of pulmonary function and worsening of asthma or chronic obstructive disease; pneumothorax, apnea, and bacterial pneumonia. 69. What are the cardiovascular side effects of Ribavirin? Cardiovascular instability, including hypotension, cardiac arrest, and digitalis toxicity. 70. What are the hematological side effects of Ribavirin? Effects on blood cells have been reported with oral or parenteral administration. 71. What are the dermatological/topical side effects of Ribavirin? Rash, eyelid erythema, and conjunctivitis. 72. What are the equipment-related side effects of Ribavirin? Occlusion and impairment of expiratory valves and sensors with ventilator use and endotracheal tube blockage from drug precipitate. 73. What is the environmental contamination concern with aerosolized ribavirin? Potential for mutagenic and carcinogenic effects; effect on fertility is uncertain caused testicular lesions in rats; and, effect on pregnancy is of particular concern and use as last line of defense. 74. What are the Palivizumab indications? Prevention of serious lower respiratory tract disease caused by RSV in children and infants at high risk. Safety and efficacy established for infants with BPD, premature infants (<35 weeks), and children with congenital heart disease. 75. What are the indications for Tobramycin? Management of chronic Pseudomonas aeruginosa infection in cystic fibrosis. 76. What is the indication for Virostatic? Stopping a virus from replicating. 77. What is the indication for Virucidal? 78. What is the Aztreonam brand name? 79. What is the Zanamivir brand name? 80. What is the Tobramycin brand name? 81. What is an indication for Zanamivir? Uncomplicated acute illness caused by the influenza virus. So there you have it! That wraps up our study guide about Anti-Infection Agents. I hope that these practice questions were helpful for you. If you put forth the effort now and learn this material, your future self will definitely thank you for it later on. Thank you so much for reading and as always, breathe easy my friend.